Modern open-combs now have thinner blades, but keep the same style that helps deal with long beards or stubble. It is also typically easier to avoid clogging due to this design. If you feel your needs are met by the open-comb razor, we’ve compiled a helpful list of the best open comb razors on the market today. The products below were chosen primarily based on the quality of workmanship, materials, and comfort. We also considered ratings and feedback from customers who have purchased and used these products and sorted them starting with the best-rated at the moment of writing. 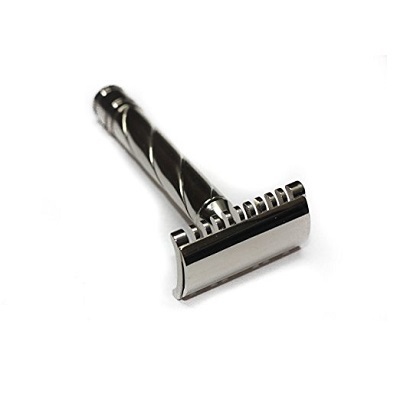 We’re including this razor from The ​Shaving Factory primarily because the price and ergomics make it ideal for those who are just getting into shaving, and there are not many open comb razors that we can recommend for the true beginner. This one will provide a close and comfortable shave even for those with little experience who want to start but are apprehensive about investing in open comb razors. 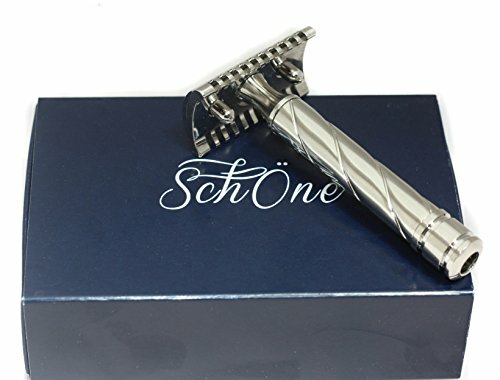 The Schone Dual Edged nickel open comb safety razor is high in the ranks of popularity, but some of the user data we’ve sifted through is a bit more polarizing. As many users claim that it is not as aggressive as they were expecting as do it is too aggressive for them. Most say it is decent in terms of comfort and ​ergonomics. 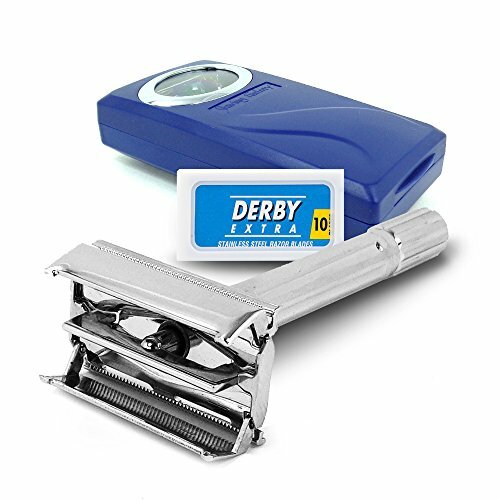 Given the possible uncertainty over level of aggressiveness, this razor is aimed mostly at experienced shavers. In our opinion, this is the best open comb razor when it comes to design. The bakelite model is very lightweight, particularly in comparison to some of the other models we’ve covered in our list. Another key difference is the precise nature of the cutting angle. The razor is constructed in such a way that the blade is locked in at a very precise angle. As such, some practice is needed to get the closest shave. More experienced users may have better results with this particular model as it offers a more aggressive shave, but the results are impressive. Although the 15C is similar to the 23C, we feel it deserves a mention here for a couple of reasons. 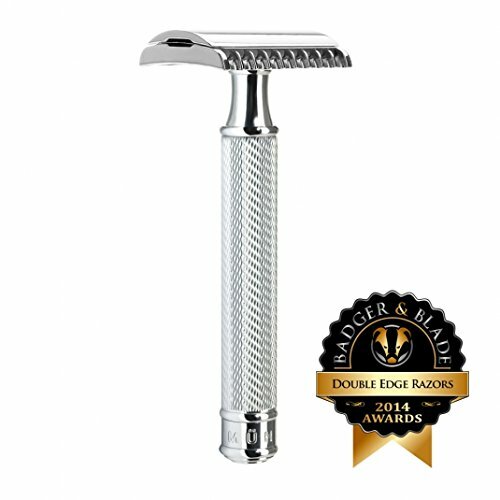 Most notably, many users suggest it is somewhat more gentle and ergonomic which makes it great for beginners, when compared to similar Merkur razors. It still provides a close and comfortable shave, but is more novice-friendly and as such, we think it is the best open comb razor for those starting out. The Fatip mirrors some of the other razors on this list in appearance, but is hollowed to provide a lighter frame and has a polished nickel finish. Most users comment on the degree of comfort, ease of use, and aggressiveness of the shave job. It handles well and provides a close shave with minimal risk of injury due to ergonomics. However, some users complained that the brass plating on the handle and head were known to flake quite easily, unlike similar razors they had used in the past. Not recommended for dry shaving, but beginners can master this one with practice. The MK 23C open comb razor has a chrome finish and provides a high-quality, close shave; this razor is both easy to use and maintain. The longer handle provides better grip for larger hands, or for those either just starting out shaving, or those transitioning from disposable razors, who may find the longer handle easier to use. The longer handle and heavier body provide better control for a more comfortable shave, and many users agree that the ergonomics make it difficult to cut oneself. Several customers have noted that application of lather, and possibly shave oil, is a must. While similar to its 23c counterpart, the chrome-plated Merkur 25c is reported by many to be less aggressive. Some believe it to be moderately aggressive while others say it is perhaps the least aggressive they’ve ever used. 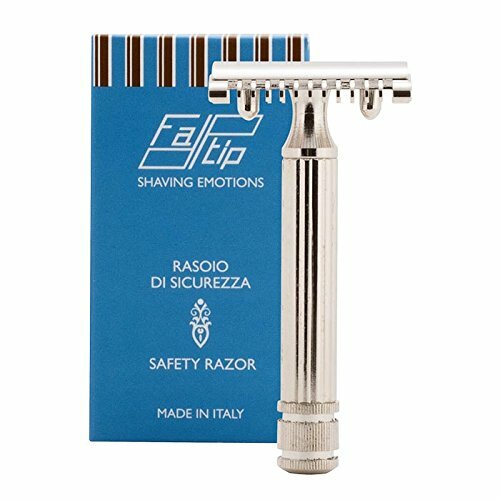 Given this response from experienced users, this razor may be suitable for those just starting shaving or who do not need particularly aggressive shaves. Many users report this is an optimal razor for shaving under the nose and other spots where ergonomics are key. Though similar to the Merkur above, the Muhle R41 is shorter. As such, if you are a beginner, you may wish to attach a longer handle (if available) to the Muhle R41. Even more, experienced shavers describe this open comb razor as one of the most aggressive shaving tools they’ve used. If you are not in need of a particularly aggressive shave, one of our other recommendations may suit you better. The Muhle’s contours offer decent protection from nicks, cuts, and clogging, and its design makes it easy to clean and maintain. Due to its aggressive cut, it’s not recommended for dry shaving or beginners; nevertheless, some experienced shavers named it the best open comb razor when it comes to longevity. Recommended read: If you are looking for a safety razor that will not give you razor burn on your first try, make sure you check out our collection of the best safety razors for sensitive skin. 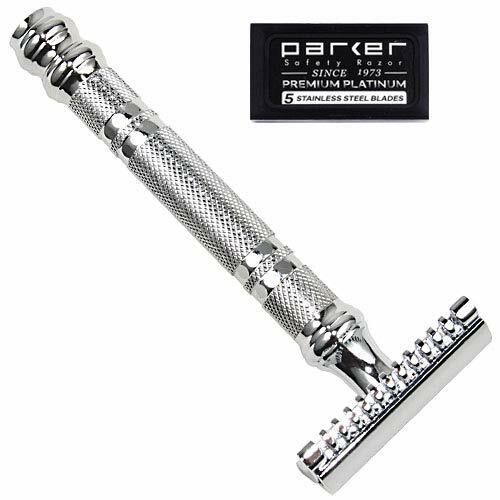 The Parker 24C model is listed by many users as being rather forgiving when it comes to mistakes or improper shaving technique. As such, it may well be the best open comb razor for novice and experienced shavers alike. 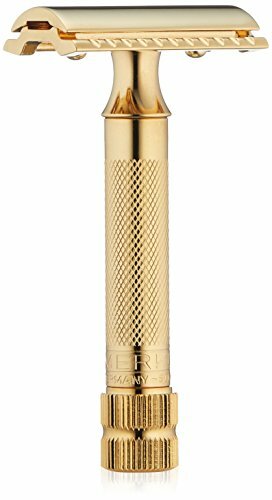 It’s made from solid brass and its 3-piece design make cleaning and maintenance a simple matter for users of any skill level. The razor is comfortable and easy to use, and many have described it as less aggressive than the Muhle R41 which makes it the second best open comb razor on the market. As with many open combs, it’s not recommended for ​dry shaving. 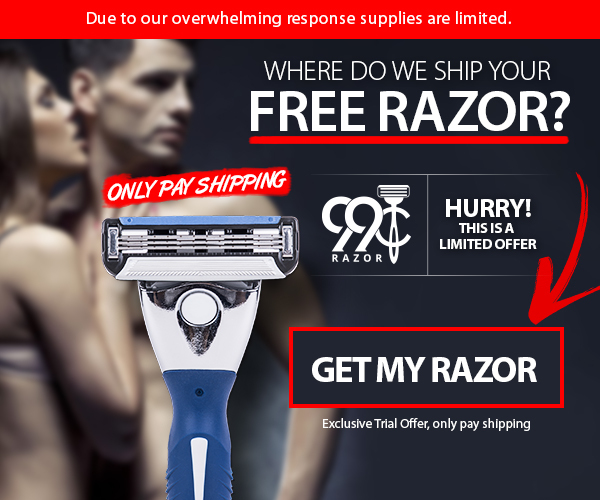 Though the company does not officially list a warranty, many users who reported issues were sent replacement razors. Another highly-rated product from Merkur, the 1904 is a somewhat shorter open comb razor that provides users with a medium-aggressive shave. It’s made of brass, but has a chrome finish. More experienced shavers may get finer control from the shorter handle, and the ergonomics of the razor allow for a close shave without injury. Some users have noted that a key difference with this razor is a lack of “audio feedback” that is typical as one is usually shaving, and found themselves checking the closeness of the shave more often due to this. This is the best open comb razor for users with some shaving experience and definitely not recommended for dry shaving. Recommended read: Before you leave, you may want to take a look at the best aftershaves on the market today. We consider the Parker 1904 Classic the best open comb razor available for online purchase in 2018 no matter your previous experience with these devices; nevertheless, the​ Oldcastle butterfly model is perfect for beginners. Products by Merkur are also reliable and long-lasting, although generally a bit more aggressive to the skin. Did you try any of the products listed in this top?